Ziggy knows that this mystery has something to do with her. She senses her grandfather knows how to help, but his mind has clouded over and when she visits him now, sometimes he barely recognises her. Can she get through to him? Can she confront her fear to find out what is lurking in the wood? When a strange boy arrives in town, Ziggy feels his connection to Hushing Wood. She is drawn to him, but he is different. And different is not something that is accepted in a small town like Dell Hollow. She knows she must find out more about him. But can she trust him? This book has a dark fairy tale feel to it, where magic and mystery intertwine to bring you a reality where you are not always sure what is real and what is in your imagination. Ziggy’s recurring dream of drowning on her twelfth birthday may be a little disturbing for more sensitive younger readers, however, as the story unfolds it becomes apparent that things are not always as they seem. 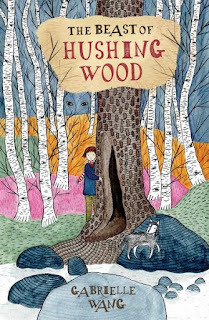 Wang’s descriptive and imaginative language creates a strong sense of place and encourages you to use all your senses to fully experience the woods and their magic. I love her description of Hushing Wood as ‘the shape of a giant sleeping cat, curled around the township of Dell Hollow, protecting it’. Writing the book in first person also gives us an intimate insight into Ziggy’s character. Her fears, her worries and her inner journey to find her place in the world. This is a middle grade novel but it would also appeal to slightly older readers as it crosses into some themes common in YA with Ziggy’s feelings of insecurity and difference. Wang has illustrated the book herself and the images really bring out the mystical tone of the book but in a slightly quirky way. There are not many pictures in the book, but when they do appear they support the tone of the text, adding interest and inciting curiosity. This suspenseful and evocative story shows the way to acceptance. Acceptance of difference, acceptance of self, and acceptance of the world around you. Even if that world turns out to be different from what you had thought it was. It challenges you to believe in the unbelievable and open your mind to the possibilities.